We’d love your help. Let us know what’s wrong with this preview of The Courage Consort by Michel Faber. With his elegant prose, distinctive imagination, and deep empathy, the bestselling author of The Crimson Petal and the White once again dazzles us in three novellas. "The Courage Consort" tells of an a capella vocal ensemble sequestered in a Belgian chateau to rehearse a monstrously complicated new piece. But competing artistic temperaments and sexual needs create as much discordance as the avant garde music. In "The Hundred and Ninety-Nine Steps," a lonely woman joins an archaeological dig at Whitby Abbey and unearths a mystery involving a long-hidden murder. In "The Fahrenheit Twins," strange children, identical in all but gender and left alone at the icy zenith of the world by their anthropologist parents, create their own ritual civilization. In each of these novellas, Michel Faber creates a unique, self-contained world, where the perennial human drama plays out in all its passion and ambiguity. To ask other readers questions about The Courage Consort, please sign up. This was a volume of three short stories that make you muse on many things. I especially enjoyed how Faber used element of Gothic Fiction in the stories. Of the three stories the one I enjoyed the most was "The Hundred and Ninety-Nine Steps". Each of these stories also has an aspect of horror that will stick with you after the story is over. It is a perfect read for a snowy or rainy day. Faber's first novel The Crimson Petal and the White was so magnificent that I leaped at the chance to read something else by this literary badass. IT WAS SO GOOD--three goodnesses, actually. The first, self-titled novella is a story about an English choral group retreating to the Belgian chateau for rehearsals on a modern piece. The second, The Hundred and Ninety-Nine Steps, is about a paper conservator on work holiday who discovers a grisly 1788 murder. Third, the Fahreinheit Twins, is the most Faber's first novel The Crimson Petal and the White was so magnificent that I leaped at the chance to read something else by this literary badass. IT WAS SO GOOD--three goodnesses, actually. The first, self-titled novella is a story about an English choral group retreating to the Belgian chateau for rehearsals on a modern piece. The second, The Hundred and Ninety-Nine Steps, is about a paper conservator on work holiday who discovers a grisly 1788 murder. Third, the Fahreinheit Twins, is the most out-there of all three, the journey tale of two neglected children living in the Arctic wilderness. wife Catherine, whose mind has been unravelling for some years now, but she still possesses the voice of an angel. A mentally unstable artist, she reminded me of Patrick Gayle's heroine from "Notes From An Exhibition", but unlike that character whom I found frustratingly opaque and exclusionary of the reader, Catherine's manias and paranoia are well rendered and credible. This was a far better portrait of the artist struggling with their sanity. The book is slight but for all that a pitch-perfectly scored orchestration of the five characters moving round one another in what is almost a prison. The two female members Dagmar and Catherine are the ones who venture out into the forest, even though for Catherine it threatens a creature whose wails unhinge her during her sleepless nights. Very quickly little routines in a foreign space are established for each character, the inter-relationship each ritual invites or excludes so that the whole is a rather wonderful tapestry of the group dynamics of a collaborative band of artists. When they are visited in turn by the festival director, the composer of the willfully difficult piece they are performing, the designer of their backdrop visuals and a Luxembourg journalist, the subtle changes in the dynamics through the intromission of each of these is fascinating to plot. Almost like particles in a collider, Faber demonstrates wonderful control over the nuanced changes and subtle changes of state. I am ever so slowly working my way through Faber's entire catalogue, not an honour I bestow readily. I think some Faber fans feel this novella to be too slight and maybe it was my circumstances that demanded a one-day read, but I am so admiring of his economy, his easy insight into human beings and group dynamics on show in this book, that I simply cannot agree with his critics here. And I don't even like accapella music, but I fell in love with this book. Maestro! Encore! This collection of three novellas by Faber runs quickly. The first and title story, "The Courage Consort" is a wonderful story with a double meaning title. It is about a group of singers who go to the Netherlands to pratice before a performance. Part of the charm comes from Faber's brillant character painting. The second story, "The Hundred Ninety-Nine Steps" takes place in Whitby, yes that Whitby and those steps. There are no vampires here, at least not in the traditional sense of the word. Fabe This collection of three novellas by Faber runs quickly. 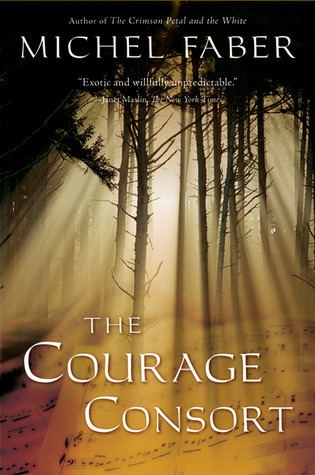 The first and title story, "The Courage Consort" is a wonderful story with a double meaning title. It is about a group of singers who go to the Netherlands to pratice before a performance. Part of the charm comes from Faber's brillant character painting. The second story, "The Hundred Ninety-Nine Steps" takes place in Whitby, yes that Whitby and those steps. There are no vampires here, at least not in the traditional sense of the word. Faber uses the town's novel reputation and gothic feeling to his advantage and tells a rather moving story about life, faith, and struggle. It also has a dog in it. The final story, "The Fahrenheit Twins" is Hansel and Gretel in the Russian Artic. It is a worthy successor to the Grimms. I've come to realize that Michel Faber is really ****ing weird, and I love it. My third Faber adventure, after The Crimson Petal and the White and The Fire Gospel is his collection of three novellas entitled The Courage Consort. I liked it much better than The Fire Gospel and can see how his wit and his sense of the strange and surreal influenced the writing of Crimson Petal. These three novellas are witty, ironic, sometimes downright ridiculous, and unexpectedly poignant at times. The three are "The Courage Consort," "The Hundred Ninety-Nine Steps," and "The Fahrenheit Twins." The Courage Consort Review"The Courage Consort" begins this collection. It tells the story of an a cappella group named, appropriately, The Courage Consort. Their group is christened such both because their founder's surname is Courage and also for the old Wesleyan adage, "sing lustily and with much courage." Roger and Catherine Courage are a married couple in the Consort who live for weeks in the Chateau de Luth, practicing a modern piece for a concert. The dynamic of the five members of the consort figure prominently in the narrative, as does the mental state of Kate, who suffers from depression. Kate has fantasies of suicide and is unhappy in her marriage. She also hears an ethereal, anguish-filled child's cry every night during her sleep. Kate is the main protagonist of this story, as she navigates her awkward, sexless marriage; her relationship with the only other woman in the consort, a sexual, confident mother named Dagmar; and the kinship she feels with bulky, overweight Ben Lamb. It's an interesting story of character development and the way these very different people manage not to rip each others' hair out. When tragedy strikes the consort, they must examine their principles and begin new lives. She closed her eyes, longing to trust him, longing to rest her head in the pillowy crook of his arm, but at the last instant, she glimpsed sideways, and saw the knife in his other hand. Her scream was gagged by the blade slicing deep into her throat, severing everything right through to the bone of her spine, plunging her terrified soul into pitch darkness. Thus this novella begins, with a thirty-something archaeology student named Siân on a dig of a monastery in Whitby. Since her arrival in Whitby, Siân has been plagued by the same murderous dream night after night. A shy, idealistic woman, Siân meets a fit jogger named Mack, a Londoner in town to handle his late father's affairs. The two are attracted to each other but find themselves constantly butting heads on issues of religion, antiquity, and faith. Siân believes strongly in the virtue of the medieval monks and priests, in the truth and nobility of history, in a higher power. Mack, a cynic, tries to disabuse Siân of her long-held notions and comes across, to me, as obnoxious and self-serving. When Mack discovers a message in a bottle in his father's estate, he enlists Siân's help with interpreting its contents, hoping for a grisly tale of murder. What they find plays with the readers' expectations of the gothic genre and sheds new light upon the nature, and sometimes contradictory nature, of religion and faith. A great, quick read with solid, interesting characters and a satisfying ending. "The Fahrenheit Twins" was my favorite of the three stories. It's set on an island near the North Pole and follows the lives of young twins Marko'cain and Tainto'lilith as they make sense of their bleak, desolate world around them. The twins are the children of ethnologists who are conducting research on nearby aboriginal communities on the island. Marko'cain and Tainto'lilith, who are probably around ten years old, were born on the island, possess impressive survival skills, know nothing of the outside world, and together, piece together little bits and pieces of facts they write down in a book. Their banter and wit and they way they finish each others' sentences lend this story a touch of levity in an otherwise bleak novella. Bleak, because their ethnologist mother dies, and their alleged father (it's implied that an aboriginal man is actually the twins' biological father) sends them on a deadly expedition from which they must find their way back. Because of my love of the North, the lively little characters, and the dry humor of this piece, it was easily my favorite. Michel Faber mi sta piacendo molto. Due libri letti e due ottime impressioni. Un modo di scrivere scorrevole che invoglia a continuare la lettura. Uno schema abbastanza classico per questo romanzo breve, ma un buon risultato senza dubbio è stato raggiunto. Non so perché ma sono rimasta un po' delusa da questo libretto... Pensavo sarebbe stato più bello, non so neanch'io come spiegarmi. Mi è piaciuto ma pensavo che, visto la sua brevità, sarebbe stato qualcosa di indimenticabile ma invece non è così. A suberb collection of three novella's written in Michel Faber's indomitable style - wonderful! İsimlendirirken kısa roman mı desem uzun hikâye mi desem bilemediğim kitaplardan biri daha: Cesaret Beşlisi. Cesaret Beşlisi aynı zamanda bir müzik grubunun da adı. Hani şu enstrüman olmaksızın sadece kendi sesleriyle müzik yapanlardan. Batı müziği hususunda bilgili olmadığım için çoğu şeyi atlamış olabilirim romanda. Bu müzik grubu bir müzik festivalinde seslendirecekleri bir parçanın -ki bu parça yarım saat filan sürüyor- provalarını yapmak üzere iki haftalığına Belçika kırsalında bir şatoya g İsimlendirirken kısa roman mı desem uzun hikâye mi desem bilemediğim kitaplardan biri daha: Cesaret Beşlisi. Cesaret Beşlisi aynı zamanda bir müzik grubunun da adı. Hani şu enstrüman olmaksızın sadece kendi sesleriyle müzik yapanlardan. Batı müziği hususunda bilgili olmadığım için çoğu şeyi atlamış olabilirim romanda. Bu müzik grubu bir müzik festivalinde seslendirecekleri bir parçanın -ki bu parça yarım saat filan sürüyor- provalarını yapmak üzere iki haftalığına Belçika kırsalında bir şatoya gidip yerleşirler. Doğa üstü olaylar filan yok, çok heyecanlı bir olay örgüsü de yok hatta ifade açısından çok zengin bir anlatım da yok. İki haftalık bir provaya giden bir müzik grubunun beş üyesi etrafında geçen olaylar. Kitabın bende bir iz bırakacağını da zannetmiyorum, buraya not almamış olsam unutacağım gidecek. Tabi kitabın bana bakan tarafı böyle, başka bir göz için az bulunur bir eser olabilir. Paritum Mutante; seslendirilmesi için prova edilen şarkı da öyle. Cesaret Beşlisi; Michel Faber adlı Hollandalı yazarın eseri. 120 sayfa. Sel Yayıncılık tarafından basılmış, Nurcan İnce Ateş tarafından incelikle Türkçeye kazandırılmış. The Courage Consort by Michel Faber follows the seventh best a capella group in the world as they share a house in the Netherlands, practising an almost impossible piece of music. It focuses on the awkward relationships and tensions between the group, with a bit of odd spooky cries in the forest added for good measure. As a short story (as opposed to a novella), The Courage Consort is a pretty good example of the form. It is filled with interesting observations and a group of characters that each The Courage Consort by Michel Faber follows the seventh best a capella group in the world as they share a house in the Netherlands, practising an almost impossible piece of music. It focuses on the awkward relationships and tensions between the group, with a bit of odd spooky cries in the forest added for good measure. As a short story (as opposed to a novella), The Courage Consort is a pretty good example of the form. It is filled with interesting observations and a group of characters that each receive their own little arcs, their own quirks. The real joy would come with re-reads and close study, which is not something I'm up for. For anyone who enjoys a short story, there will be plenty to please in this slim volume. I wanted to like it, I truly did, but I could NOT STAND the female leads of the first two stories. I found them unsympathetic and annoying. Trust me, women do much more than worry about men all the time. I enjoyed the "murder" in the second story and how it turned on itself and make you reconsider your own perceptions. I wish the Fareignheit Twins could have been longer and more fleshed out, it had so much potential. Door Fabers observatievermogen en goedmoedige spot krijgen we een milde satire op de asociale trekjes van kunstenaars, maar meer dan dat is het ook niet. Ik blijf buiten de personages staan. I like Faber's imagination. These stories kept me interested because each was so different. I'm not a fan of the endings, hence four stars on each book of his I have read, but I am a fan now. The Crimson Petal and the White will be next, though THAT one will take me a while. This book is made up of three novellas. I loved the second one and like the other two. The author is an excellent writer, but I much preferred his novel The Crimson Petal and the White to this book. Tedious book about tedious characters doing tedious things. Big disappointment after liking everything else I've read by Michel faber. Slightly strange but a good imaginative writer. What an extremely talented author. Interesting story and mix of characters. Not sure of the madness element. Faber presents the mastery of great writing. I read this book as an assignment for a craft class and I loved it. This collection of three novellas actually rates a 3.5 from me; the writing is definitely above-average. I suspect that my problem is partially with the form itself: the narratives are not short enough to be short stories with a "zing" - that focus that E.A. Poe talks about - nor are they long enough to make plot complexity a necessity. So bear in mind that I may simply be a grumpy reader in not giving an out-and-out 4. Of the three, I enjoyed the title novella, "The Courage Consort," the most. I This collection of three novellas actually rates a 3.5 from me; the writing is definitely above-average. I suspect that my problem is partially with the form itself: the narratives are not short enough to be short stories with a "zing" - that focus that E.A. Poe talks about - nor are they long enough to make plot complexity a necessity. So bear in mind that I may simply be a grumpy reader in not giving an out-and-out 4. Of the three, I enjoyed the title novella, "The Courage Consort," the most. It's a character study of sorts, of a group of singers in a King's Singers-like a capella group, but one that contains women, and one that takes its mission more seriously (according to their leader), tackling atonal twentieth/twenty-first century music. There is a newbie in the otherwise long-standing circle, a young German woman named Dagmar, an individualist who brings her baby along to their rehearsal "retreat" in a European house. Faber gives this set-up considerable interest by making his POV character self-doubting and possibly unreliable - she's Catherine, the soprano and the wife of Roger Courage, the leader of the group. We get to speculate a bit about what is causing her self-doubts: she fantasizes suicide a couple of times, she rejects sexual overtures from her husband, and she hears a child's cry in the night, possibly a confirmation of local legend - possibly also triggered by the nearness of Dagmar's baby? Anyway, the last two members of the Consort - a rather grouchy, possibly gay tenor named Julian, and a quiet, overweight basso named Ben - seem at first glance the least interesting. But it is actually Ben's passing that produces the main movement of the plot, and we see that Catherine is not quite so incompetent as she fears, for it is she who manages to bring back the Consort from their depression, at least a little way, by finding a summer song - interestingly the most ancient possible - that they spontaneously sing. There is also a wonderfully satiric passage earlier on about the visit of the self-aggrandizing, incomprehensible composer. The second novella, "The Hundred and Ninety-Nine Steps", is also told from the point-of-view of a female character who is undergoing some mental disturbance. In this case it is grotesque nightmares about being murdered in her sleep. It later transpires that these mirror a story of a local (apparent) murder of a young girl by her father - he does it to prevent her from appearing to be a suicide, which she is. This story, when it emerges (from a bottle) crystallizes the differences in life philosophy between Sian and Magnus, the young man she fears she is attracted to. Sian is seriously wounded, both physically (an amputated leg) and spiritually, by a previous relationship in Bosnia. The steps of the title lead up to the archaeological dig on which Sian works, digging up bodies, but they also represent her efforts to elevate herself towards something of the emotional austerity and discipline of St. Hilda and her monastery (the site of the dig). This is another point of contention with Magnus. The imp in me adored that the resolution of the relationship was that Sian accepted and renamed Magnus' dog Hadrian (whom she adores in a thoroughly sensual manner), but she let the man go, hoping he would eventually mature to her tastes. This is a short, tight, novella, with nary a spare word used. It is the story of a 5 piece acapella group, who have agreed to try out a new piece written by a very rich (and somewhat "otherworldy" mentally) German and get two weeks in a Belgian Château to practise. The novella starts with Catherine - married to the group's founder Roger Courage - coming out the other side of psychological problems, which include depression and a hinted-at suicide attempt the year before. They meet up at the Châtea This is a short, tight, novella, with nary a spare word used. They meet up at the Château and there are soon tensions (both mental and sexual) underlying the daily practising. Dagmar - the other female in the group, who has brought her baby son Axel with her - loves biking and mountaineering, and soon begins an unlikely friendship with Catherine simply by going out biking daily and inviting Catherine to come with her. Daily exercise, with someone who doesnt seem to judge her or put her under pressure (plus no longer taking the anti depressants) goes much to changing Catherine during the book, to the point where casual acquaintances dont recognise her at first. Catherine's insomnia makes her thing she hears human like cries in the woods at night Dagmar says she doesnt hear them. Catherine goes out walking one night, spending all night in the wood and comes back the following morning in a dream like state; what happened over night and whether the screams were real are never revealed, which some readers find frustrating, but if the novella is read as a traditional Gothic novel (The Mysteries of Udolpho, or Jane Austen's wind up of "Northanger Abbey") then these situations rarely are. Faber’s novella about an a cappella group may appeal to individuals who sing chorally. The Courage Consort derived their name not just from the Wesleyan adage about hymn singing – “sing lustily and with good courage” – but also from their reputation of performing music lesser musicians would lack courage to deliver. Faber wrote with versatility and an insider’s knowledge of the tensions, disagreements, conflicts that coexist with rapturous moments of seamless harmony when a group sings together. Faber’s novella about an a cappella group may appeal to individuals who sing chorally. The Courage Consort derived their name not just from the Wesleyan adage about hymn singing – “sing lustily and with good courage” – but also from their reputation of performing music lesser musicians would lack courage to deliver. Faber wrote with versatility and an insider’s knowledge of the tensions, disagreements, conflicts that coexist with rapturous moments of seamless harmony when a group sings together. The setting is a Belgium chateau nestled in a bewitching forest where the five musicians were to spend a fortnight rehearsing their latest commission, a highly complex and daunting classical avante garde work, Pino Fugazza’s Partitum Mutante, noted for its disquieting disharmony. Faber ingeniously captured the tension – vocal, professional, sensual – that suffused the rehearsals. The dynamics of this strange vocal group were subtly described and rendered palpable in masterful sotto voce prose. Although each a credible professional in his or her own right and impeccably competent, the group was a curious band of eccentric individuals all of whom were dysfunctional in some strange way. Faber created five interestingly weird individuals: Roger Courage, baritone, and the leader of the group; Catherine Courage (Kate), soprano, Roger’s clinically depressed wife; Dagmar Belotte, contralto, sporty and lactating female with an infant in toll; Julian Hind, tenor, dashing like a French movie star but sexually restless; Ben Lamb, the very fat porridge-eating bass who silently seemed to covet a tryst. My favorite character is Kate who, at the beginning of the novella, was off Prozac and on the brink of suicide. Yet she was the most unpretentious and likeable member who had the audacity to confess she thought “partitum’ meant “underpants”. Faber wrote with some insight into how a depressed individual can find healing, as Kate did in the forests. A tragedy that befell the group came as a shock and I felt a pang of loss. No magical ending but I thought it moving the novella closed with an ancient round as the group headed home. A very strong four stars for this collection of three novellas. Faber's The Crimson Petal and the White ranks with Ian McEwan's Atonement as the two best novels I've read that were written this century, but I did not care for Under the Skin at all. These stories are completely unlike either work in theme and setting, but Faber's master characterization abilities in The Crimson Petal are on display here. The Courage Consort concerns a singing group sequestered at a cottage in Benelux to practice a A very strong four stars for this collection of three novellas. Faber's The Crimson Petal and the White ranks with Ian McEwan's Atonement as the two best novels I've read that were written this century, but I did not care for Under the Skin at all. These stories are completely unlike either work in theme and setting, but Faber's master characterization abilities in The Crimson Petal are on display here. The Courage Consort concerns a singing group sequestered at a cottage in Benelux to practice an offbeat composer's work. This does not seem terribly interesting at first blush, but the way Faber creates very real characters very quickly turns it into a great story about individuals coalescing, or not, to form a team. The Hundred and Ninety-Nine steps is the weakest of the three, in that's it's merely very good rather than great, as a doctor and conservator meet by happenstance on grounds that monks and nuns shared for centuries, and the 199 steps that were walked up to bury them. The ancient murder mystery is unique and the play between the two leads is very on point with reality. The Fahrenheit Twins is a brilliant tale of two 10 year olds isolated on a Siberian island with their anthropologist parents from Germany. The twins, self-sufficient for all intents and purposes, build their own lives and quasi-religion away from their parents, one of whom may not have their best interests at heart and neither of whom has the pair as their first priority. The novella has potential given that setup however it was never going to be a rollercoaster ride. It reads very safely, that is like a Radio 4 play. More annoyingly though is the fact that nothing much happens in the novella. The sexual tension is never acted upon and the wailing ghostly cry in the forest is mentioned a few times and never resolved. A few cartoon-like characters make an appearance as eccentric eurotrash but do nothing more. The group bicker for much of the book until the sudden ending and that's it. Faber was born in The Hague, The Netherlands. He and his parents emigrated to Australia in 1967. He attended primary and secondary school in the Melbourne suburbs of Boronia and Bayswater, then attended the University Of Melbourne, studying Dutch, Philosophy, Rhetoric, English Language (a course involving translation a Michel Faber (born 13 April 1960) is a Dutch writer of English-language fiction.